Available in other leathers. Double cone coil springs of high carbon tempered steel produce the ultimate in seating comfort. Eight-way hand tied construction provides durability and luxurious seating. We use only premium, highly resilient polyurethane cushions to ensure consistent shape and comfort. Fabrics are hand matched and perfectly fitted to cushions and frames to create the finest furniture in our industry. 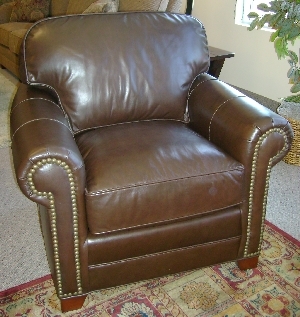 We take great pride in the quality and attention to detail in each piece of our furniture.